OK, it took me a while to take my business from a full-time J.O.B. to affiliate marketer, author, publisher, speaker and Internet business consultant. Just like you (perhaps), I wanted to quit my job so I started looking for ways to replace my income and doing business online seemed like the best option. Other than desire, I had no skills other than surfing the web and sending & receiving personal email. Online business training was practically non-existent, so I took it one day at a time and my business grew. Here is a step-by-step account of the process. June 1996 Launched first website, a flower seed exchange. Despite my lack of design skills however, and with no training, by the end of month 10, I was banking $5,000 US per month. April 2000 By the end of 1999, I was netting $10,000 US per month, so I quit air traffic control to become a full-time Internet marketer in early 2000. June 2001 Took a month off to tour South America and bought my first Mercedes. It's IMPORTANT to have goals. December 2002 Net earnings for the year totalled $436,797!! April 2003 Online business success story profiled in Internet Marketing Center's Secrets to Their Success (STTS) which was later re-published in Small Business Opportunities magazine. June 2003 To get a handle on the information requests generated by the STTS interview and to teach others what I'd learned about affiliate marketing, I published “The Super Affiliate Handbook: How I Made $436,797 in One Year Selling Other People's Stuff Online“. Started a Telephone Consulting service for affiliates. Since then, the service has expanded to help affiliate program managers and online merchants grow their businesses. October 2003 My very first radio interview was with Marty Nemko on KALW, 91.7 FM, a National Public Radio affiliate in San Francisco. The story was covered in the San Francisco Chronicle's “Work with Marty Nemko” column in November. Since then I've participated in 100's of radio interviews, teleseminar and podcasts. January 2004 Success story published in the premier issue of Revenue Magazine (Article – 5 Who Thrive), the only glossy magazine related to affiliate marketing. March 2004 Overcame a huge fear of public speaking to speak at JV Summit. See below for a list of other conferences at which I've spoken. April 2004 Launched NetProfitsToday.com (now this site – RosalindGardner.com, a companion site and newsletter to the Super Affiliate Handbook, to keep SAH readers informed of industry changes. June 2004 I moved back to British Columbia's Okanagan Valley to enjoy its fabulous scenery, weather and laid-back lifestyle. So much for laid back! I got busier than I'd ever been before! October 2004 Co-produced the audio course Affiliate Business Blueprint with Jim Edwards. June 2005 Accepted invitation to write the Affiliate's Corner column for Revenue Magazine. October 2006 Co-produced the 6-week multi-media BlogClassroom course with Anik Singal of Affiliate Classroom. July 2007 McGraw-Hill published ‘Make a Fortune Promoting Other People's Stuff Online‘, a book they requested I write on the subject of affiliate marketing. 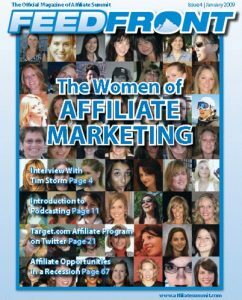 January 2009 Profiled in FeedFront Magazine's “Women of Affiliate Marketing” issue. FeedFront is the official magazine of the Affiliate Summit conference for affiliate marketers. March 2010 Launched Affiliate Blogger PRO, the multi-media version of the Super Affiliate Handbook. Now Continue to maintain a number of affiliate sites and blogs including 101Date.com, RosalindGardner.me (a personal blog), WindingWay and this one. Doing business online has been (and still is) a blast. I've enjoyed much good fortune and had the pleasure of working with experts and luminaries throughout the industry. Best of all, my business allows me the free time to frequently indulge my almost insatiable wanderlust and spend 5-6 months of the year (winter in Canada) RVing with my 2 favorite people on the planet, my hubby Ed and our Chocolate Labrador, Jasper. Got wanderlust too? How about a deep-seated desire to quit your job and start living your life to its fullest? I can help you put your game plan together and I'm always happy to help!